Eighteen Auburn University faculty members were recognized with Auburn Author Awards at a ceremony Wednesday in the Special Collections and Archives Department of the Draughon Library. The Auburn Author Awards program, sponsored by Auburn University Libraries and the Graduate School, recognizes faculty and library staff members who published a book-length scholarly work during the previous calendar year. 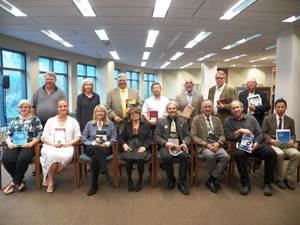 The Auburn Author Awards program was resumed in 2011 after a hiatus of several years. More information about the authors and their publications can be found here. An archive of past winners can be found on the Auburn Author Awards Web page.